I played hockey this weekend. On display were all my typical bad passes, weak shots and accidental crashes into other players and there’s absolutely no doubt about it… I am ALREADY in mid season form! 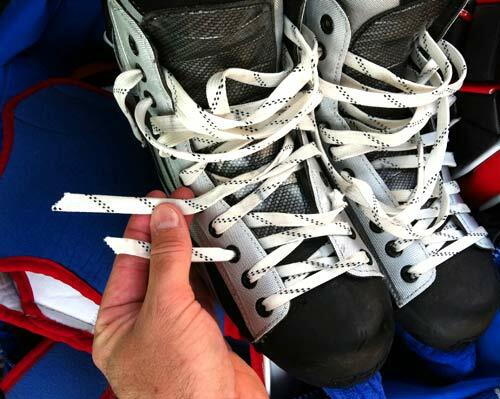 Afterwards in the locker room I noticed my skates were unlaced in a strange location. On closer observation it became clear that someone had obviously skated right over the top of me and sliced my laces in two without me knowing it. I sometimes float through life somewhat oblivious to what’s happening around me, but perhaps it would be a good idea for me to pay a little closer attention to my surroundings when I’m playing hockey.